Machined from 6061 aluminum in the USA! 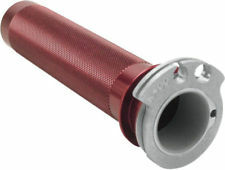 Self-lubricating Delrin bushings at each end of tube eliminate aluminum-to-aluminum contact for an ultra-smooth feel. Largest possible cam to fit inside stock housing included. Fits inside stock throttle housing with stock throttle cable.